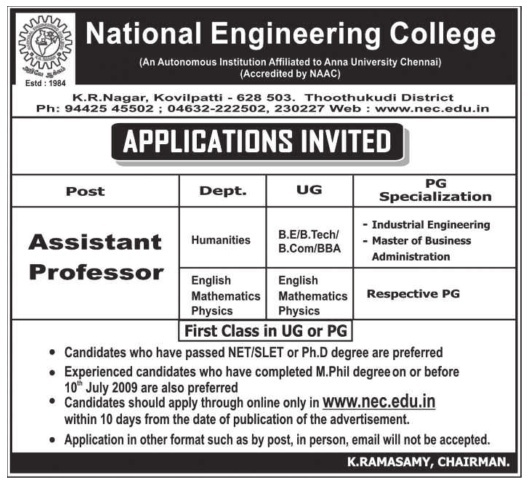 National Engineering College, Kovilpatti has advertised in Dinamalar newspaper for the recruitment of Assistant Professor vacancies. Interested and eligible job aspirants are requested to apply within 10 days from 13th June 2018. Check out further more details below. About College: National Engineering College, Kovilpatti, Tamil Nadu offers a wide variety of high quality education and training opportunities for every student, awarding qualifications through the highly reputed Anna University that is recognized as world class. The college offers 7 under-graduate and 9 post graduate programs in a wide range of disciplines. Sprawled in a green luxuriant campus, with the alluring backdrop of an enchanting hillock, in NH7 between Madurai and Tirunelveli, NEC provides an exemplary locale for academic pursuits in South Tamilnadu.